May 12, 1943 Friends of R.B. Dainard, 67 King St. will be interested to learn that he has joined the R.C.A.F. July 20, 1943 Friends of AC.2 Bruce Dainard R.C.A.F. will be interested to learn that he has been transferred from Trenton On. to North Sydney, N.S. January 18, 1944 LAC. 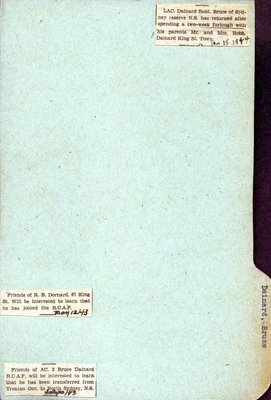 Dainard Robert Bruce of Sydney reserve N.S. has returned after spending a two-week furlough with his parents Mr. and Mrs. Robt. Dainard, King St. Town. This card is part of a larger collection of World War II personnel clippings. The project began in 1944 at the Lindsay Library. The intent was to gather together as much information as possible on the military record and the service of people from the Town of Lindsay and the County of Victoria (now Kawartha Lakes) who served in the war. To that end, during the years 1944, 1945, and 1946, members of the public donated photographs and updated information about their loved ones. Both library staff and the public saved and donated newspaper clippings. Some of the files contain great amounts of detail, while others have just a name.